"I have been hired to suppress the rebellion of yet another tribal leader. Apparently, this is the only job for which I am suited. I am beset by the ironies of my life." On the surface, The Last Samurai is an ambitious epic that is sprawling and rousing and belongs with the best in the genre; beneath the surface, it is a character study packed with beauty and emotion. The film represents a welcome return behind the camera for director Ed Zwick after having crafted several of the best films of the 1990s. Here, he has quite possibly constructed his best work to date, one with beautiful cinematography, outstanding production design, and two performances that are absolutely terrific. Tom Cruise and Ken Watanabe star as warriors from opposite sides of the world, with drastically different outlooks on war and, ultimately, peace. Cruise plays Nathan Algren, a revered Civil War hero who spends his time after the war getting drunk on a daily basis. He is approached by his former commander in charge, Colonel Bagley (Goldwyn), who asks Algren to help train the Japanese army in modern warfare and lead them into battle against the samurai who are threatening to stop the production of a railroad across Japan. He unwillingly accepts the offer and soon he is a stranger in a strange land, all the while dealing with alcoholism and horrific flashbacks from the battlefield. Soon the Japanese army is ready for their battle, and encounter the samurai army under the command of Katsumoto (Watanabe), the result of which is a massacre of Algren's men, and the foreigner is taken captive. He awakes in Katsumoto's village, and his wounds from battle are tended to by Katsumoto's sister, Taka (Koyuki), who is now a widow after Algren killed her husband in the horrific battle. Through the winter and spring, Algren begins conversing with Katsumoto, learning the ways of the samurai, all the while romancing Taka. Soon, Algren must decide which side he will be on for the final battle between the samurai and the army. While Tom Cruise receives top billing for his role as Algren, the picture truly belongs to director Zwick and Watanabe. For Zwick, the film has an epic, sweeping feel that he makes seem effortless, and while it runs over two and a half hours, the director keeps the viewer enthralled in the story throughout. In the supplemental features, Zwick discusses his influences and his love for the material, and it shows in the finished product. The script addresses spiritual undertones as well as parallels between the time of the samurai and ours. The Last Samurai introduces Watanabe to an international audience. There is such beauty and grace in his delivery, and he displays great presence on screen. Watanabe's portrayal embodies everything Katsumoto believes in, effectively conveying the loyalty and honor so important to his character. It is an amazing performance that serves as the cornerstone of the film. Cinematographer John Toll paints lush surroundings for the story, and although the film is heavy on story and underlying emotions, it is Toll's work that gives the quieter passages their power. The costume design also merits attention; Ngila Dickson gives the samurai an almost mythical look as they move into battle adorned in armor from head to toe. 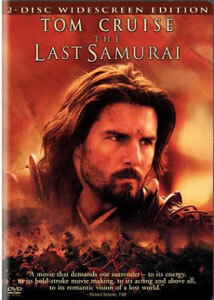 Overall, The Last Samurai is a very impressive piece of filmmaking from director Zwick. It is ambitious, beautiful, and most importantly, involving throughout. Image Transfer Review: Presented in a beautiful 2.35:1 anamorphic aspect ratio, The Last Samurai looks better on DVD than it did when i saw it projected theatrically. Colors are solid with no bleeding; fleshtones also appeared natural. Sharpness and detail are given priority and the scenic beauty of Japan is conveyed very well here. I did notice a small amount of edge enhancement in several of the more softly lit scenes. This is a reference quality transfer. Audio Transfer Review: The Dolby Digital 5.1 mix for The Last Samurai is a tad disappointing given the nature of the film. The surround speakers are used for the most part during grand battles, but during the film's numerous quiet scenes the mix comes to a standstill. Ambient sounds are only occasionally and slightly present, while the front speakers do a fine job of reproducing the score from composer Hans Zimmer. The .1 LFE track provides tight and crisp bass during the battle sequences, rounding out what can best be described as an average mix. Extras Review: The Last Samurai comes to DVD in an elaborate two-disc special edition. The first disc contains an extensive commentary by director Zwick, and while the track will become repetitive after having viewed the extra features on Disc 2, it is an engaging track to be sure. Zwick discusses nearly every aspect of production from scouting locations to stunt work, and covers his choices in the progression of the story as the film was edited. It is clear that Zwick has a deep love for the project and he goes into detail about the various themes woven into the story. The director is a huge fan of his leading man, and touches on the willingness and determination of Cruise at several points. On Disc 2 is home to Tom Cruise: A Warrior's Journey. Running nearly 13 minutes, the piece focuses on the extensive training the actor underwent and his appreciation of the samurai culture. The next two documentaries feature director Zwick. Edward Zwick: Director's Video Journal presents footage from the set with commentary by the film's helmer. There is little to be learned here that can not be heard on the exceptional commentary. Making an Epic: A Conversation with Tom Cruise and Edward Zwick runs just under twenty minutes and is a candid conversation on the set between the director and his star about their mutual respect and the pleasure of working with a top flight cast and crew as well as how they conveyed the emotions that they strove to achieve. A History Channel documentary, History vs. Hollywood: The Last Samurai is a fascinating piece that details the actual events that inspired the film. What sets this piece apart is that it is rich in informative material and very entertaining, and I wished it could have lasted longer. Two deleted scenes are included. While one offers an acknowledgment of how revered the samurai were in 19th-century Japan, the other focuses on the growing friendship between Katsumoto and Algren. Both scenes would have been put to good use if kept in the original film, a rarity in the area of deleted material. Three brief featurettes cover production aspects: costume design, production design, the weapons used in the film, and basic military training. Though ignored during the awards season, The Last Samurai is grand and thrilling filmmaking. Director Edward Zwick has created a moving story that will stand as a benchmark in his career, as well as that of his leading actors. Highly recommended.